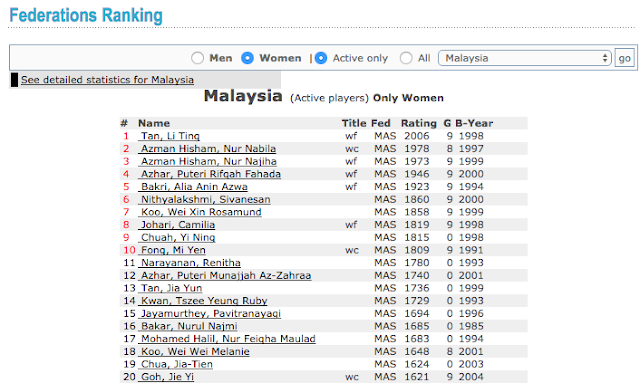 The latest FIDE rating list - May 2016 - has just been published and including the Malaysian Championships and Malaysian Masters where practically all our top women players took part, it is perhaps time to take stock of where they are. I will be as diplomatic as possible but facts are facts and no doubt there will be some proud parents who will take offence. The first thing that jumps out is that Tan Li Ting is our No. 1 and the next is that with former No. 1 Alia Anin Azwa Bakri at the end of a long comeback, we again have a core group of five girls that are now simply just a little better (more consistent) that the rest, the only main difference being Puteri Rifqah Fahada Azhar has definitively replaced Camilia Johari or Fong Mi Yen. Of these several have been around now for many years so it is however hard to see Nithyalaksmi, Camilia and Mi Yen displacing any of the top five unless they continue to slip (the stagnancy of their play as confirmed by the ongoing decline of their ratings would certainly give hope). The rest do not lack experience either but probably not enough top level competition so that now that Jimmy Liew is working with Rosamund Koo it will be interesting that she can take a step up while in the case of Yi Ning, she arguably has what it takes but was the unlucky player left out of the Malaysian Masters.